Interesting portrait of the artist and his work gives us an intriguing way into his large scale project that is overwhelming when seen on film. I can only imagine what it looks like in person. This film record of the project it really is something special. What I really liked was that we got a sense of the artist in motion. How does he do what he does? How do you attempt to pull something off on this grand a scale? As much as I like the film it presents a slight bit of disappointment in that I really didn't get as good a sense of the artist as a man as much as I would have liked. 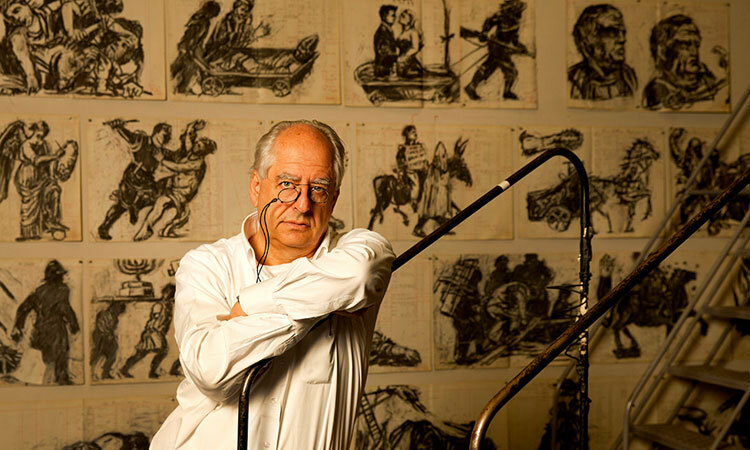 Yes I know some of Kentridge's work, especially his films but until I saw this film I never had any idea who he was as a person. Now having seen this film I have a glimpse but there is enough here that I wish I had a bit more. Its a minor quibble, and ultimately not really the focus of the film- it's the work that's ceter here which is fine. Definitely worth seeing hen the film plays on January 17 and 19. For tickets and more information go here.